Blizzard is hiring, but not experimenting. We've heard hints, suggestions and even outright confirmations that Blizzard was planning on porting its highly anticipated gothic hack-and-slash to consoles. In an interview with Gamasutra, however, game director Jay Wilson said that the reality was a bit more nebulous than that. 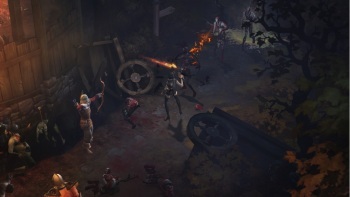 "We haven't officially announced [Diablo III on consoles], because we're not 'experimenting,'" said Wilson. "We tell people that basically we're experimenting, because it helps us hire people. The better people we hire, the better chance we have to actually make it." "That's why we haven't kept it super secret, but we also haven't confirmed it, because we're not sure yet whether we think it will work, and whether we think we have the resources to do it." With regard to the question of resources - I know that Mr. Wilson has been hard at work finishing Diablo III, so we can cut him some slack, but it seems that he's forgotten that the company for which he works also operates World of Warcraft. It probably has the resources to build a moon base. That said, of course just throwing money at a problem doesn't instantly lead to a solution, especially not for a studio as notoriously meticulous as Blizzard. It also begs the question what the people Blizzard is hiring are doing if not "experimenting." Are they sitting around all day eating sandwiches? Letting hungry gerbils into the server rooms and snickering? Inquiring minds want to know! In all seriousness, it's interesting to hear that D3 on consoles, which most of us thought was as close to a sure thing as one could get, still hasn't even reached the "experimenting" stage. I suppose that right now, Blizzard's Diablo team has other things on its mind. The full interview with Jay Wilson is a fascinating read, especially if you're interested in the development and design of a game like Diablo III. Check it out over at Gamasutra.